“In god we trust” was on coins in 1864 and added to paper currency in 1956. It comes from a line in the Star Spangled banner. The 1864 inclusion came out of a petition to include a reference to god in 1861, in part to imply that God was on the Union’s side during the Civil War. It actually was removed from coins in 1883 and reintroduced, replacing the US motto of E Pluribus Enum (One of Many) because of the cold war and to distinguish the US from communist nations where religion was actively forbidden. 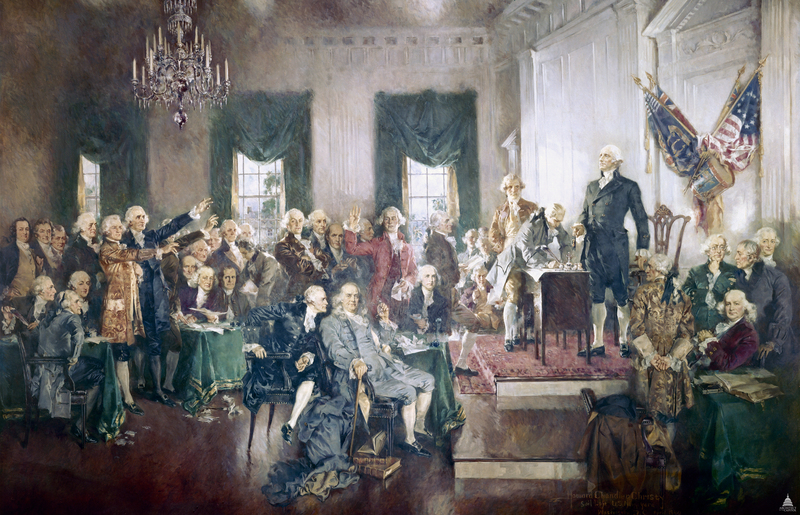 There actually isn’t much historical fact about the religious intent of the founding fathers. The Declaration of Independence, which is not a legal document, refers to a Creator, Nature’s God and Divine Providence without explicitly referring to an specific deity. Some argue that Jefferson’s early drafts of the Declaration actually included no talk of a creator, but he was pressured to include the vague notion contained within. The Constitution doesn’t mention God, and all the Amendments say is “Congress shall make no law respecting an establishment of religion, or prohibiting the free exercise thereof”. In the treaty of Tripoli, unanimously ratified in 1797 by a government still very much tied to the founding fathers, you’ll find the text “As the Government of the United States of America is not, in any sense, founded on the Christian religion”. To the original point then about redefining society. The USA was established and has evolved through it’s laws and amendments to its Constitution as a redefinition of society. At our formation, we were an experiment in politics, redefining the relationship of the government to the people it governs based on equality and equity. At the time, Monarchies were the norm, with a strong nearly absolute head of state. So I would argue, if any country should be redefining a part of society, that the US has most history in this department. To speak to the darwinian argument for a the heterosexual norm in which homosexuality is a mutation or deviation, that over simplifies things. Perhaps if we were isolated, non-social animals which only came together for procreation, this would be a logical argument, but we’re not. Our evolutionary success is not just due to our ability to make babies with each other. If it were, we’d likely be a very unsuccessful species because of the long gestational period in which child carrying females are very vulnerable for long periods of time. That developmental stage is important to the evolution of our self-aware consciousness and intelligence and is very much a result of our organization into massive cooperative social structures. So as long as humans show no since of population decline, which we don’t (quite to the contrary), there isn’t evolutionary support for heterosexual procreation uniformly across the entire species. There are other social species in which there are large numbers of asexual members from ants to naked mole rats. There is evidence of homosexuality in other social species as well and in some cases this is recognized as rising out of the need to successful rear offspring by multi-member family/social units. So if anything, to me, the darwinian argument should be that homosexuality is good for the species to properly rear and care for children who would only have one parent otherwise.